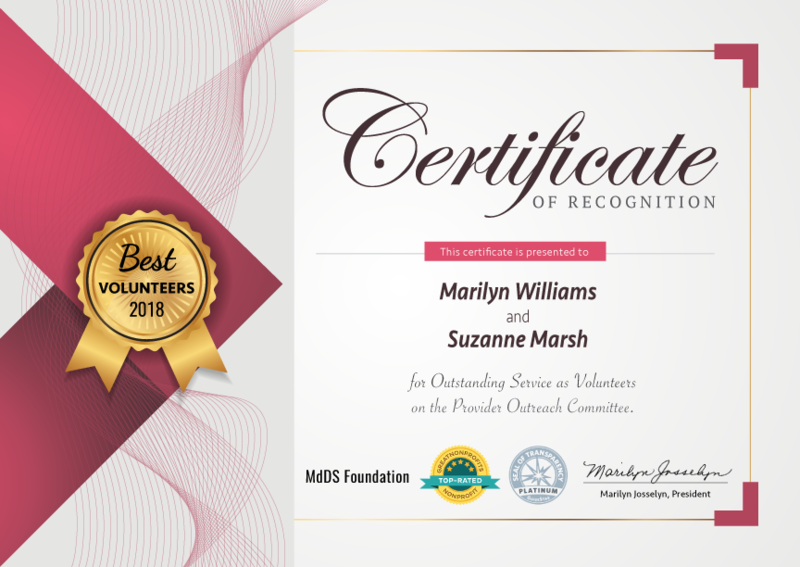 The MdDS Foundation is pleased to introduce you to our Provider Outreach Committee, co-chaired by Marilyn Williams and Suzanne Marsh. The committee works to raise awareness of MdDS among health care providers and to provide you with the best Professional Directory possible. Marilyn Williams is an MdDS warrior. She diligently researches and updates information on health care providers whose names have been submitted as medical professionals who have diagnosed and/or treated MdDS patients. The submissions date back to 2003, when the Foundation’s first support group was established. The information we receive is maintained in an extensive database used for a variety of purposes, first and foremost to create the Find-a-Doctor Professional Directory. It is also used for outreach efforts, most recently a direct mail campaign to a select list of medical professionals at top teaching institutions. It is imperative that we identify new medical professionals who can recognize the features of MdDS and, ideally, are willing to join research efforts. In addition to ensuring accuracy of directory information, Marilyn conducts research to identify medical professionals who may not be familiar with MdDS but should be. These professionals are not restricted to practicing clinicians. The Provider Outreach Committee reaches out to leads that include professors at teaching institutions, department heads, and vestibular and balance disorders researchers. The committee provides these professionals with educational materials such as our brochure (designed to give to newly diagnosed patients) and a quick reference card on MdDS. The informative card provides medical professionals with the diagnostic criteria for MdDS to enable them to quickly make a diagnosis. Suzanne Marsh brings a background of medical industry familiarity to the Provider Outreach Committee. In just a few months, she has personally called over 130 health care providers – even in Australia, the UK and Italy – and mailed out our materials to educate them about MdDS and the Foundation. She is the mother of an MdDS warrior and is the kind of volunteer we should all aspire to be. Through outreach, 24 states and 7 countries outside of the US are now represented in the Professional Directory. Will you help us get all 50 states and more countries into the directory? We are looking for doctors that you personally recommend, to help more MdDS patients get the medical support they deserve. We also face a challenge of doctors with an interest in MdDS entering retirement. We need your help identifying medical professionals either interested themselves or who might influence the next generation of health care providers to have an interest in MdDS. Thank you for sending their contact information to provideroutreach@mddsfoundation.org. In August, Suzanne became our newest Board Director. 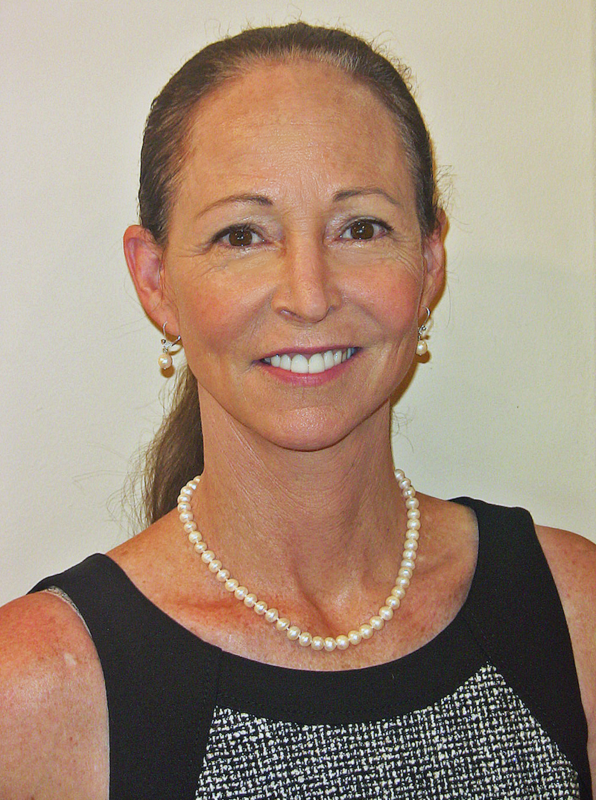 Suzanne has worked in a variety of clinical, administrative and marketing medical settings. The only Board member that is not a MdDS sufferer, she will continue to focus on provider outreach while assisting the Board on a variety of projects. DID YOU KNOW? We have board members in all four time zones of the United States. From the east to west coast, we are where you are. My husband suffered a blow to the back of the head 18 years ago. He experiences many of the symptoms you describe with MdDS. For a time he was good but lately his balance, head bobbling and upper body seems to move involuntarily. We have flown about 4 times this year. I’m wondering if he could have MdDS which is overlooked because of the head injury. How do find out if this could be. This has totally handicapped his lifestyle. I pray you can offer some answers. I to a 2 day cruise and the 1st night the water was ruff and now I been back 5 days and I keep feeling light headed. Do u think I need to get checked out or will it go away. The Foundation does not diagnose or offer medical advice. Feeling like you are still on the boat for five days is not abnormal. We hope your symptoms abate quickly, but if they persist and you suspect that you have Mal de Débarquement Syndrome, you will need to consult with a doctor to develop a plan of action. A brief list of health care providers who may be familiar with MdDS is available through our Find a Doctor tool.